Seize The Clay: These Clay Water Bottles Make For Great Eco-Friendly Gifts! Whether you're hosting a celebratory dinner or a baby shower, it's always nice to pamper your guests with a party favour, that will leave them with fond memories. And if you've been looking to gift something on a budget, do yourself a favour and check out Mud Born's products! 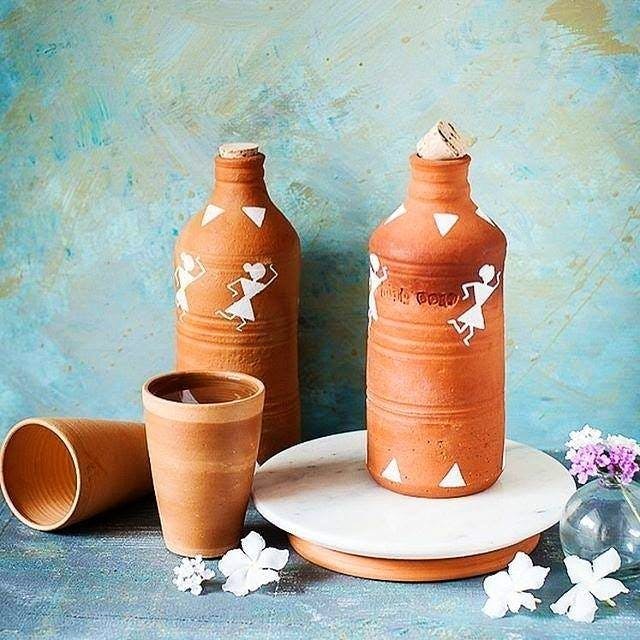 Earthy, pretty and folksy, their handcrafted clay bottles and coolers feature tribal art paintings with organic colours. Clay, as we all know, is porous and acts as a natural cooling agent. Plus, it has multiple health benefits and looks Insta-worthy, so you will be gifting #goodvibes and #highenergy. What's more, they are pocket-friendly - prices start from INR 250-800 for 10 bottles, depending on the holding capacity of the bottles and whether you want them painted or unpainted. If you have a green thumb, you will especially dig their colourful in-house planters. Priced at upwards of INR 300, they're easy to maintain, cute and perfect for upping your home decor style. You can only order in bulk, (more than 10 bottles per order). Also, since they don't have their own website to shop from, you will have to reach out to them on social media.